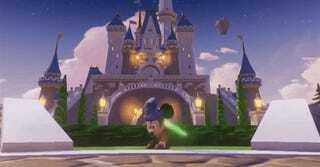 Which Is Cooler, Mickey With A Keyblade Or Mickey With A Lightsaber? Raise all 29 toy-based characters to level one in Disney Infinity and you'll score a glowing green Star Wars surprise. NerdFlip shows us how it's done. There are two Disney properties players have been clamoring for since the debut of Disney Infinity — Star Wars and Marvel Comics. With the latter slated to be revealed during a press event on April 30, could magical adventures in space be far behind?